They're all coming, or at least they will be when work, friends, a probably futile attempt to exercise, actual summer weather and other (non-Johnny) pesky distractions stop pulling me away from the call to blog. 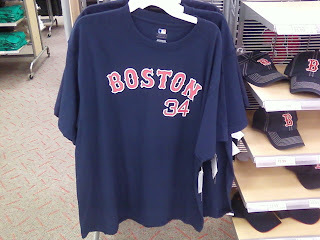 In the meantime, here's a photo of a Big Papi t-shirt jersey that is NOT on sale at Target in Framingham (or possibly Natick--I can never tell the difference). Scandal or no scandal, an "Ortiz 34" shirt will cost you $17.99, just as the Jason Bay ones behind it will. Personally, I was kind of hoping for a drug-scandal sale, but no dice. Rats. I'll have to be happy with my favorite new garment, my George Brett Kansas City Royals throwback t-shirt jersey purchased at the New K in KC.